Einstein. Newton. Tesla. Watt. YOU. All these people have something in common...they were graduates of the STEAMed Up Science Camp at St. Stephen’s!! That’s not true, but YOU can be! This summer, at STEAMed Up Science Camp, campers will dive head-first into Science, Technology, Engineering and Design through collaborative and real-world projects. 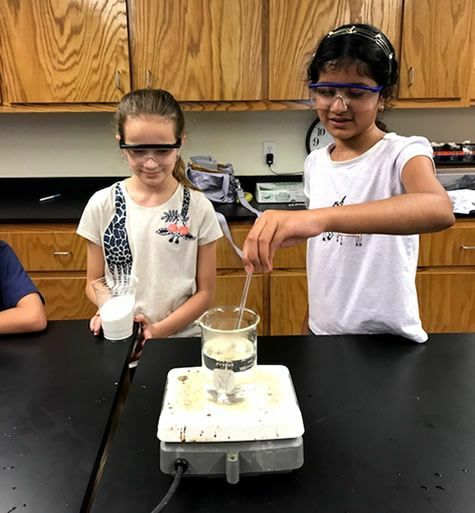 Campers will be able to see, touch, hear, smell, and taste ALL science has to offer by learning about slime, electricity, exploding chemical reactions, ecosystems, gravity and MORE in the engaging, hands-on activities. Balancing all of this fantastic time in our STEAMed Up Science Lab, campers will have daily outdoor activities and pool time! We hope you will join us for a HAIR-RAISING (no literally, we are going to defy gravity with your hair using the Van der Graaf generator) time at the 2019 STEAMed Up Science Camp.